On July 3rd, 2018, an incredible thing happened. Hawaiian Governor David Ige signed Senate Bill 2571, making Hawaii the first state to ban the sale of sunscreens with octinoxate and oxybenzone in them -- chemicals that are known to cause harm to coral reef ecosystems. This bill, which goes into effect in 2021, is a victory for Hawaii; not only for its people but for coral reef ecosystems around the world. We applaud and formally endorse Hawaiian efforts to protect coral reefs through policy and education. Hawaii’s coral reefs are a cornerstone for the Hawaiian tourism economy, a national ecological treasure and a deeply spiritual symbol for all Hawaiians. With this decision, they are taking a bold and honorable step towards rejuvenating life into their corals, and revitalizing the Pacific Ocean. This is a remarkable milestone for the health of people and of the ocean. But. This isn’t over. The #ReefFriendly sunscreen movement has just begun. There is still so much work to do. We could talk about the 30+ states with a coastline that need to follow Hawaii’s lead and acknowledge the harm of chemical sunscreens. We could mention that the sunscreen you use on a mountaintop will still affect coral reefs in our oceans. We could say that oxybenzone and octinoxate are not the only indicators of a toxic sunscreen. But for now, we’ll leave you with this. To Governor Ige, Thank you for signing this bill. 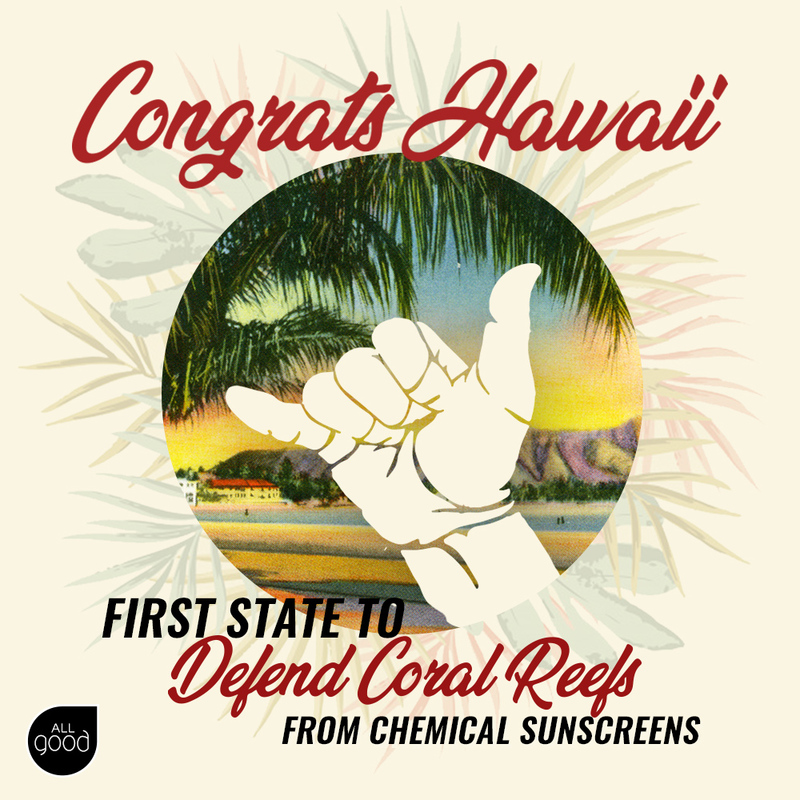 This was an incredibly important step for the future of Hawaii’s ecosystem, and for further educating travelers, citizens, and ocean lovers about the damaging effects of chemical sunscreens. To all of you -- wearers of sunscreen & lovers of the earth; businesses or consumers -- the responsibility is on us. In order to allow coral reefs to rebound, we must make lifestyle decisions that take all living things into account. Simple, individual acts can change the world.